Typhoon Halong swung away from Korea and did much of its damage in Japan, granting this peninsula a pass on the gigantic storm that was barreling towards us only days earlier. The only marks left from the storm were some ferocious yet soothing winds sweeping along the south coast for a day and a half. This IS August, so a nice breeze comes as a welcome change against the blistering heat normally found during this time of year. For once, we can spend some time outdoors at a place like Suncheon Bay and not at the beach. Suncheon Bay is special, in a country with cookie-cut cities so compact and built from the bottom-up. Not even Korea’s largest wetlands, this gem is far enough away from the growing city of Suncheon to receive designation as its own town. The country might be forgetting its origins and traditions and Koreans will happily admit that things are changing. Nature still remains on their minds. Tourists continue to frequent these familiar natural wonders. Sites like Suncheon Bay remind me that quiet and space can still be found. No claustrophobia. No sense of hurry. Only silence. I can’t believe the beauty found here. Begging for a revisit, Halong’s winds provide a perfect peak season day for beach-goers. Suncheon Bay is much less crowded than the beach today and home to perfect conditions. The human-sized reeds are wonderful, especially when the wind swishes them around like tiny blades of grass. Hiking to the top of tiny Mt. Yong gives visitors a beautiful overhead view of the bay. Yeah I’ve seen it all before but who cares? 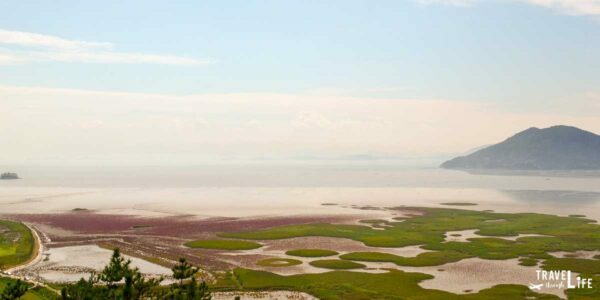 Revisiting the past might hold us all back but honestly, places like Suncheon Bay make sense. Why not go back? Seeing something again helps form new and exciting pictures. For me, Suncheon Bay’s serenity leads me to think that not even 100 visits would provide a complete understanding. Why worry about seeing everywhere and everything when there’s so much in one location? Christina’s pictures, as always, tell the tale in a much clearer and more colorful way. Talk about exciting. We’ve written a lot more about South Korea and would love for you to read my stories and guides on this wonderful place. This Suncheon travel guide is part of our series on South Korea Travel and East Asia Travel. It was originally created on August 13, 2014. It has been maintained and updated (as of December 28, 2018) to reflect current viewpoints and travel trends. I often revisit the same places in Korea. Even though Korea is a fairly small country there is still so much to see, which is one of my favorite things about this place. I really want to get back to Suncheon as well. Hopefully I get the chance before we leave next spring. Sucheong Bay look beautiful! I’ve gotta check that place out when I get back to Korea. I like how you describe Korean cities as “cookie cutter”.